This document is the official report signed on June 20, 1944 by Generalfeldmarschall Karl von Rundstedt, commander-in-chief of the West German forces, describing the first tactical teachings a few days after the Normandy landing. Intended for the fighting forces and in particular the reinforcements moving towards the zone of fighting in the west, this document testifies to the German vision of the events. Text translated by Marc Laurenceau. Source: Office of Naval Intelligence. “The O.N.I. Weekly”. 3, number 46 (15 Nov. 1944): 3692-3699. 1. The experience is useful when promptly reported to the attention of the soldiers. This will be done as and when several messages are sent. 2. The following feedback summarizes what has happened so far. The services operating under the term “Distributor” are responsible for evaluating and completing the details according to their own judgment. The latest teachings from the most recent battles are broadly consistent with all the teachings of Sicily, Salerno, Nottuno as well as defensive battles in Italy. The proximity of the British motherland to Anglo-Saxon transport and supply during their first offensive on the western side of the Bay of Seine and along the Cotentin Peninsula to deploy a greater number of men, equipment and technical means. Preparations for this offensive, which are led to the means of quasi-scientific methods, have proved easier to carry out because of the large network of agents working in the western occupied region. The orders of the preparation and conduct of the actions of the invasion are extraordinarily numerous and varied. Feedback from this particularly important battle must be taken into account in the training and applied to all sectors not yet subjected to combat, they should also be brought to the attention of the Commands military units on the front lines, mission units, protection forces, etc., in all occupied areas. (1) Total control of airspace by the enemy. (2) The control by the enemy of the deployments of airborne and air-transported troops, as well as the massive nature of these deployments. (3) The support of the troops on the ground by the artillery embarked on board of powerful English warships, as well of cruisers as of gunboats, which proves to be precise and diversified. (4) Knowledge advanced in its mission for each enemy unit participating in the invasion; particularly accurate information on the coast, its obstacles and its defensive installations, which allow the enemy to have a force superior in numbers and materials after only a few days. Faced with this stands the German soldier with his qualities, but also his inability to react quickly and his lack of motivation to fight in a joint framework. The three armies have done their best to this point and will continue to do so. (a) The enemy hoped to surprise us. He did not succeed. 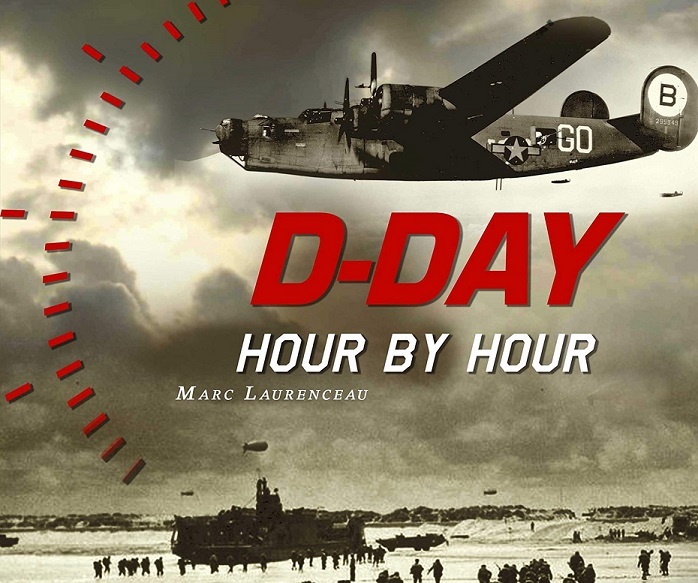 The air operations began on June 6, 1944 at approximately 01:00 west of the Bay of Seine and above the Cotentin, in a cloudy sky, a bad weather with a lot of wind, intermittent showers and a dismounted sea with troughs of four meters; the enemy carried out a powerful bombardment simultaneously in different places. The objective of the enemy was to put us on alert and to oblige us to remain under cover in order to allow him to begin the parachutages without risking being observed. In several places, the paratroopers turned out to be puppets (with caissons containing explosives). The goal: to divide our local reserves and disengage them from their crucial station point, involving a waste of time for the defender. The airborne troops, engaged inside numerous gliders of various sizes and which have begun their descent above the sea or directly in the vicinity of their landing zone, have landed in different places in a coordinated manner according to a plan well established that has worked, reaching their goals accurately. Nevertheless, these assaults by the air were not a surprise to the extent that our own command and our troops had been expecting them for weeks and were ready. Thus, enemy parachuted and airborne troops suffered high casualties (and in some places particularly bloody) and were occasionally destroyed during their engagement. They have not succeeded in destroying coastal defense from inland. Only in the area of ​​the American bridgehead north of Carentan, following our simultaneous attack on three sectors, the airborne troops went to the defensive sector of the coast after hard fighting for several days , thus making their junction with their own land forces which had succeeded in piercing and being thus reinforced and placed in reserve. The techniques and tactics of enemy airborne forces are highly developed. Particularly seasoned and prepared for battle, these soldiers proved to be powerful fighters, adapting quickly to the terrain! We must admit that it is possible that in addition to parachuted troops, special units with special missions (reconnaissance, actions on command posts, depots of ammunition, communication centers at the rear, etc., demolitions, breaking actions) and different from those carried out within the framework of the invasion can also be dropped. We must establish with accuracy and by all means possible their potential objectives. 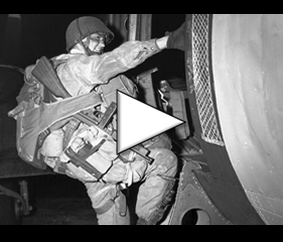 (b) The landing itself began four or five hours after the airborne assault. The enemy anticipated its preparations to set foot on land with the rising tide – a fact we had previously considered very likely – and at low tide due to the presence of numerous underwater obstacles along the beaches, which he was aware of. This maneuver was repeated several weeks before the actual disembarkation by landings in England. The enemy was then able to cross the lines of submarine obstacles along the beach to his tanks while special troops breached the rest of the troops. The vessels and the men on board suffered heavy losses at the places where the sea covered these obstacles and those on the dry side slowed down the tempo of the disembarkation, increasing the enemy losses due to our shots. The beginning of amphibious operations. Completely visible, led from 06:00 in the morning. Before the landing, there was a massive bombardment of an impressive intensity coming from the air as well as from the sea, using all weapons and calibres. As a result, campaign defenses were more or less disrupted as well as only the strongest fortifications remained intact. The enemy has infiltrated the breaches created without attempting to attack these important fortifications and fortified points. These fortified points held in some cases for more than a week, thus dividing the enemy forces. Holding to the end, they allowed their own leaders to save time and prevent an enemy breakthrough through the bridgehead. (c) The enemy air forces. Although limited in their range, they control not only the main battlefield but also its surroundings and supply routes at a depth of 150 to 200 kilometers. In addition, enemies bring war on the front of the Reich territory through its tactical bombers with the aim of destroying the extensive railway network, in particular marshalling yards, locomotive repair centers, bridges and important sectors related to the military industry. In addition to targeting the particularly developed railway network and the numerous main and secondary roads, the enemy managed to interrupt the supply and reinforcements by its air attacks, causing so many losses among the reserves and the motorized columns that the questions refueling and the arrival of reinforcements have become serious problems. The closer you get to the frontal area, the more frequent the attacks of fighter-bombers on the roads. By their attacks, they prevented any major movement in good weather and also at night using flares. The effort of the enemy air forces has concentrated on the main roads, but they now attack any form of movement in an area at least 20 kilometers behind the front line while keeping their actions at the heart of the battle . If enemy reconnaissance planes detect a troop race, a formation of bombers appears in the sky and attacks without delay. It is absolutely essential that motorized vehicles keep their distance between them in the columns. The command stations manage to keep the connection through their wireless station. – Radio stations must therefore remain at a reasonable distance from their command post so as not to be hit in the event of bombardment. When the command posts are not concreted, their position must be changed regularly. Prior acknowledgments must be planned; positions are then transmitted to unit commanders so that command posts can be found. Within two and a half days, the enemy bridgehead had a depth of about 100 kilometers and nearly 29,000 enemy aircraft exits; 2,300 aircraft per day dive and bombard any movement on the ground, even for a single soldier. (d) Additional effects – Rail transport which, due to the total traffic situation, has been reduced to a minimum, can only operate up to 200-250 kilometers from the front and without any forward planning. The timetables of the railway lines change every hour according to the meteorological conditions; trains can move from stage to stage or can only travel at night. Thus, as already noted, violent air attacks can lead to the blocking of cargo on certain sections of railways. The terminals are constantly changing, which has consequences for the unloading of the units and the installation of refueling points, thus requiring extraordinary flexibility of the command and the mobile labor units in order to carry out orderly rapid discharges at the whistle. The progression of day is to be avoided by day. Short summer nights must be profitable from dusk to dawn to recognize roads and crossings, prepare flexible commitments, organize fast walks in separate groups, avoid major roads and deploy in rest areas already recognized. Troops must be ready for low-level attacks and be able to use all possible means of protection immediately. The long marches of mechanized units throughout the countryside and the transport of supplies during these marches over long distances also result in losses due to enemy actions, both technical defections and troops. The command must take these losses into account and eliminate them while being able to bring troops, supplies and reinforcements to the right place and at the right time. Our own systematically applied countermeasures must provide a systematic operational response to the strategy of the enemy. (a) In secured areas, new units transported to all reinforcement rally points must be kept informed of the air situation, the course to be taken when the danger arises and when the alert is sounded, as well as during unloading operations. Advanced patrols should not be sent too soon. The element leader of each advanced patrol must report regularly to High Command West or to the Army High Command. In accordance with the rules of the general commanding the western troops, a large number of (small) maps must be prepared at all unloading stations for distribution by representatives of the Transport Command to newly arrived personnel. (The same procedure must be applied for patrol leaders of the Army High Command, etc.). During the marches, combat patrols should be made up of guides who know the places and other units to be surveyed. The recognition of bridges must be carried out systematically and on time, as destruction may have occurred in the meantime. The order of march and the guarding of roads in secured areas are under the responsibility of the military command which must be kept informed and in time concerning the arrival of new units, the objectives of a march and patrols, etc. .
(b) In the vicinity of the fire zone, all movements to the battlefield by day – change in troop disposition or adoption of new formation – require more time than before with the taking into account of significant delays. Therefore, movements and battles must take place in dusk and darkness to prevent the effects of enemy air forces and direct observation by enemy gunners. The organization of the entire battlefield requires a rigid organization from the rear to the first line of the front. The commanders of the traffic units must be required to control the traffic coming and going towards the front, the circulars around the villages must be listed on the map and indicated by signs. The equipment used to make the panels must be prepared, roads and crossings attacked by enemy aircraft must be signaled with danger signs, and traffic must be reduced to small formations that only circulate in the air, obscurity or weather conditions equivalent to darkness. Passages for incoming and outgoing refueling must be established at the same time as the recognition of stop zones for columns outside the bases. Small, well-dispersed intermediate supply depots should be constructed in suitable locations and should be secured. The appointment of responsible officers (essentially from the engineering corps) is required for continuous road maintenance; with the support of the units entrusted to them, these officers must help the inhabitants in a permanent state of practicability. Any light anti-aircraft weapon not strictly necessary in the rear security zone (protecting already destroyed targets or no longer playing a secondary role) must be deployed in the supply points on the front; ripostes will be made to all low-altitude attacks. II — Camouflage in all its forms must be encouraged over and over again. – The chain of command and troops should know that when a unit is detected by an enemy aircraft it will be attacked from the air until it is completely out of combat. For example, embargoes for tanks must be made at irregular intervals on the right and left of the roads, under the responsibility of the officers in charge of traffic and with the help of the inhabitants available as well as that of the troop. It is always necessary to have a camouflage adapted to its environment. Roads must be cleared of vehicles damaged by the maintenance service of the axes, as soon as possible. III-The enemy deployed a very strong naval force off the bridgehead. It is used as a very mobile artillery system, always available, capable of firing defense when attacking or supporting one of its attacks. By day, very effective corrections of shots are made by aerial observers as well as advanced observers on the front. The rapid fire rate and range of naval guns allow the enemy naval forces to play an important role in the battle. Any movement of day-tanks in open country is to be avoided within the range of action of the naval artillery. IV – The enemy was able to stop the attack of one of our divisions which had gained ground by employing its airborne forces in such a way that the support of this division are obliged to engage the combat during the progression. They prevented the division from carrying out this attack. We must admit according to the facts the enemy will continue to use this practice, even if our tanks attack. Thus, all units at the rear of the front must stand ready to defend themselves immediately in order to destroy the airborne forces. V – The enemy prepares attacks of limited scope with pretenses of artillery dams, using small trench mortars, which precede the tanks themselves supported by the motorized infantry. VI – The population must be strictly controlled, particularly those traveling on the road fleeing fighting in the combat zone and in areas located at a distance from the front. If each alert unit is used appropriately, the situation on the roads may change rapidly. Suspect persons, especially young men wearing “small suitcases”, can secretly insert themselves there. Anyone who does not originate from a particular location or who can not clearly explain their destination must be arrested and handed over to the concentration units. VII – Communication and signals. Wired connections in the combat area are unusable. Apart from radios, only the mechanical means of communication – the bicycle or motorcycle scooter, the officer aboard a sidecar or a light armored vehicle, and for short distances a courier on foot. The whole troop and the leaders must do their utmost to understand the whole situation and seek liaison with superiors or subordinates, especially when the nominal means of communications no longer function. This is especially important when the leaders are strengthened or when they take command of a greater unity. Chiefs must be continually informed of the position of the vanguard of these units to also take into account the stops and the continuation of the progression. It is essential for the command to be permanently informed of the location of the motorized units which are an integral part of the ground movements. These units or units of units must be taken over by liaison officers who accompany them and who issue orders to them when necessary. The liaison officer knows the position of these formations during the hours that follow and is able to report to his superior. He may also transmit to his chief the troop’s necessities concerning his needs for food and refreshments and to provide for them. During the first days of the great battle, it appears that, under certain conditions during the battle, the troop’s formations are abandoned or transformed. It should only be a temporary emergency solution. As soon as the conditions allow it again, clear orders must allow a reorganization of the formations. I voluntarily explained these experiments in detail because a large number of units to the west have newly arrived and do not know, in spite of the previous orders and instructions, the course to be taken in the battle.